The UK's finest wedding musicians including harpists, string quartets, bands, tributes and more. Our website contains demos, photos and references of all types of performers making choosing your music fun and easy. Essence Music Agency only offers carefully selected musicians that set exceptionally high professional standards. They insist on seeing all their musicians performing before ever representing them to ensure you are booking the best. By supplying you with the highest quality entertainment we will guarantee an unforgettable experience for all involved! All acts that are provided come tailor made to your event, whether it match a specific theme or colour scheme that you have in mind. Stilt Walkers, Fire Performers, Hosts/Hostesses, Meet and Greet Characters and much much more! Photo Booth hire for Weddings. We are specialists in weddings and our state-of-the-art booths ensure every precious moment is captured. We offer a huge range of features including Marryeoke, wind machine, video message recording, green screen technology and much more. Our attention to detail is what makes us the number 1 choice for so many couples! Silent Disco Kit offers a unique wedding entertainment package which allows the guests to listen to multiple music channels with the use of our wireless headphones. Best4Booths are the finest Photo booth hire & chocolate fountain hire company in the Midlands, servicing Nottingham, Leicester and Derby for all your parties, weddings and corporate event. VW Photo Booth and wedding car hire covering the North East. Rosie our custom built VW Campervan Photo booth is a quirky alternative for your special event. Bouncy castle hire suitable for kids and adults. Make your special day special for the little ones too by having a castle at the reception. Castles are suitable for indoor and outdoor use. OMG Bouncy castle hire is a leading bouncy castle hire cover the Midlands with a special service for Weddings. We supply the best party packages and equipment for events in the west midlands. From bouncy castles, soft play, cake table to chair and table covers. Birmingham Based. Airmazing Inflatables are a family run business offering Bouncy Castle and Soft Play Hire. Our Bouncy Castles and Soft Play is an ideal add on to your big day. Entertaining Children at weddings is our specialty but entertaining children is our passion. 4 piece function & wedding band based in Glasgow, Scotland. We play a huge variety of music & offer flexible payment terms. Piano music for civil wedding ceremonies and receptions in South East England. We're an explosive, high-energy wedding band from Yorkshire that performs across the UK. Your wedding will be the most memorable day of your life, and it is important that you hire the right professional people to ensure everything goes without a hitch. Professional close up magician available to entertain your guests during pre dinner drinks and evening reception. I'm an acoustic wedding singer and DJ available throughout the UK. The best live bands and string quartets, elegant harpists and stunning gospel choirs, organists, acoustic acts everything in between, traditional, unique and fantastic! Exceptional and affordable string quartet/trio for all occasions - Weddings, Functions, Corporate Events and more. Massive list of songs and music styles. Bristol-based string quartet providing live music for weddings and events in Bristol and the South West. Varied repertoire - hear samples & get more details at the website. Atlantic Sound are Yorkshires premier Function band. We play the best in rock and pop music through the decades. We have a range of packages available to suit your special event. Jinks & Flicks Muti Award Winning Slow Motion Booth Specialists. captures those one off natural smiles and emotions through advanced videography. An outstanding professional string quartet with particular experience in weddings. 4tissimo offers a wide range of musical styles to suit all tastes from Bach to the present day. Add a touch of class to your wedding! Planning a Bond themed event? We have all the music from the 007 movies arranged for acoustic or electric string quartet. James Bond wedding entertainment. We provide music to suit all tastes from the 50`s through to today. We will work with you prior to your special day to ensure that you and your guests have a wonderful time! Our Disco Bouncy Castles are always a big hit with the kids at Weddings. Not just a bouncy castle but a music and disco lights show within a bouncy castle. The Titanium String Quartet London is a professional ensemble available for weddings and other special occasions. Published, prize-winning poet will write a personalised poem for your Big Day. Entertain your guests at your wedding reception. Fun & games for adults, treasure hunt for the kids & activity packs on every table - all this and prizes too! The Finishing Touch String Quartet can provide professional live music for your wedding day. Book the very best in Live Wedding Bands in Wales. Hire the very best & the most popular Wedding bands Wales. If you are looking for inflatable fun, then you’re in the right place,Arc Bouncy Castles has a huge range of bouncy castles and soft play for hire across Birmingham, Solihull. For a Magical Childrens Entertainer during your wedding or special occasion. Magic, Juggling and Circus Skills Workshops, Games and Balloon Modelling. Member of The Magic Circle, Equity and CRB approved. Strawberry Letter Duo are the perfect daytime wedding entertainment choice. Subtle, beautiful music for ceremonies, drinks receptions and wedding breakfasts. Book Pikabooth for your special day and we will also create your very own personalised prop! We would love to hear from you and to share your special day with you! RS Bouncy Castles provide bouncy castle, inflatable slide and soft play hire for all occasions. We cover all areas of Lincolnshire and further afield. One of the best wedding bands on the scene in Scotland, playing hits all night long. Chris Connelly plays piano at weddings and events in Glasgow, Edinburgh and across Scotland. Covering an eclectic range including jazz standards, classic pop, bridal marches and hymns. Blaze Fireworks offer exquisite professional firework displays starting from a very affordable price point. All wedding displays include FREE extras including heart shells. At Warrington Kids you will find a wide range of bouncy castles, soft play, garden games and much, much more all at a price you can afford. Add fun and memories with our state of the art party photo booth. Great for weddings parties and celebrations. High quality instant prints. Optional green screen. Sanders Catering, Inc. specializes in catering corporate and special events throughout Memphis and the Mid-South region. Warble Entertainment Agency supply wedding entertainment and wedding bands for weddings and civil partnerships all over the UK. With a wedding entertainment roster full of the UKs best live music and entertainment. Lovely Booths is Cheshire and North Wales' supplier of beautiful open air photo booths, crafted elegantly to add an extra bit of style to your wedding! 1st Choice bouncy castle hire offer a wide range of party rental equipment suitable for Weddings and many other celebratory occasions. NRG Music & Productions is the top choice for award-winning live entertainment for your next event or wedding. City Nights Discos is a mobile disco service provide that consists of a team of mobile DJs and entertainers managed and run by Vernon Francis. Experienced professional classical wedding singer based in the South of England. Do you require a great Wedding Band & DJ? Book the very best & most popular Wedding Bands in the UK. Create the Ultimate Fun Factor of casino tables for your special day. Keep your guests entertained to the very last minute. Choose from full sized Blackjack and Roulette tables for that magical evening. Wedding and Event guitarist.Beautiful romantic music from around the world Mediterranean,Irish ,Scottish,french and popular. Award Winning Wedding Entertainment from Looch - Mind Reader & Magician. Specialising in weddings in the UK & Europe. Treple-X is an accomplished Bedford-based wedding singer whose soulful voice and natural ability to entertain will provide a wonderful finishing touch for your special day. Professionally created song lists. Find songs through playlist categories: days of the year, eras, genres, love, musicians, top 10's, topics and our most popular - weddings! We are an independent hot tub hire company based in Wakefield and operational throughout West Yorkshire. We offer a choice of hot tub sizes, with packages to suit all budgets. bouncy castle and wedding hire buiness based in Gloucester. We have a stunning white wedding castle perfect for your special day. Titanium String Quartet provides elegant music for your wedding ceremony, drinks reception or wedding breakfast. Based in London, this female ensemble performs classical to pop. Precious Moments specialise in providing on site mobile creche facilities across Surrey, Sussex, London and Kent. Packages start from just £175 and tailored to meet your needs. I'm a soprano singer, available to sing during your ceremony. I sing a wide variety of material from classical to pop, and offer a highly personalised service. Competitive rates. Invite a celebrity to your wedding reception party from just £27.95. None are over £38.00. They are bound to turn heads and be a talking point at your party! GUARANTEED! Bird & the Bad Man are an acoustic duo with a lot of experience in weddings. Playing a wide range of music to suit all tastes, Sarah's amazing vocals will leave you stunned and Andy's rhythmic guitar will have everyone up dancing. Looking for the Perfect DJ for your Wedding?! You've come to the right place. Let Marvel Functions take it from here. Located in Buckinghamshire Wow your guests with this fantastic and fun way to capture memories on all occasions. Live caricaturist as well as studio digital caricatures at your disposal. Boo's Inflatable Games is a leading provider of bouncy castles and inflatable games hire across the West Midlands. The UK Firework Company provide spectacular, professional firework displays for all occasions across the UK. Perdido Street are one of the UK’s longest serving Jazz Bands, performing across the UK and abroad. Their repertoire ranges from Traditional to Mainstream, Modern and Latin Jazz. We provide professional fireworks display for weddings and other special events through out the Uk. Gedling Bouncy Castle Hire is an inflatable hire company and has been established since 2014. We have supplied many inflatables to weddings in and around Nottingham. Hire the coolest photobooth around! Our VW campervan houses a state of the art animated gif and instant print booth. Grab a crazy prop and strike a pose! The Northern Monkeys are one of the top wedding bands in the UK. They have a sublime repertoire for clients to choose from to make their party or function as enjoyable as possible. The Pod Group provide unique, innovative and interactive entertainment ideas for wedding entertainment hire and private party ideas, creating unforgettable experiences. Ace inflatables, we hire out bouncy castles, assault courses, inflatable slides and games, through out Sussex, Surrey and Kent. We set up and collect all of our bouncy castles. The Supertones are a unique, professional 4-piece wedding & party band, available to hire UK wide. Their repertoire includes hits from the 60s to modern day. Suitable for all ages. Professional face painting service. Great for children & adults Full public liability insurance, quality approved facepaints and lots of designs to suit any theme or request. We provide live cover bands for weddings across the UK from our HQ in Yorkshire. Incognito Artists takes event entertainment from ordinary to extraordinary. Party Covers band formed 2010 based in the North West. Five, Four piece, Trio and Acoustic Duo. DJ service, First dance performed live. Classical Guitarist/Pianist add on options. We are the premier wedding & party hire company of Norwich. We hire bouncy castles, candy carts, sumo suits, disco domes, soft play and other great products to parties in Norfolk. Our aim is to provide childcare at your chosen wedding. Children will be safe and looked after with the highest possible care and kept entertained by qualified staff. Bouncy castle hire bedford - Bedfordshire fun. The regions most active themed bouncy castle hire company. We have fun inflatables for kids and adults, indoor and outdoor use. Mark Waddington is undoubtedly one of the most sought after Magicians. With several years of professional experience under his belt, you know you are on to a safe bet booking him! Premier entertainment agency providing top quality wedding entertainment. Friendly and reliable service. Any enquiries welcome for disco's, bands, vocalists, magicians etc etc. Fun casino is the latest craze on the Weddings entertainment scene and will add an exclusive touch to your wedding at very Competitive Prices. Ex Casino Croupiers, Authentic Casino tables at the venue of your choice. Big Bounce Ltd are an inflatable hire and events company based in Eastwood, Nottingham. We have over 100 different inflatables and activities. We're based in Welling, and are a small, family run business. We're not a huge company, but we believe that makes us different; We're small enough to care, big enough to cope! Video Gaming Party Bus, perfect to entertain the kids at your reception! 12 screens, comfortable bench seating, lots of fun! Available throughout East Anglia. DBS checked. If you are looking to hire something unique for your special day, then our portable crazy golf or mini golf courses are perfect for you. Hire 9 fully portable crazy golf courses! Nanna Radleys are a high energy pop, soul and funk band who specialise in weddings. Superb vocals by sisters Sarah and Lauren Bird who are backed by the best musicians in the UK! Bouncy castle hire company based in Norwich. We are a family run company and have some great products and great reviews! Please view our website or give us a call. Champions Music & Entertainment is dedicated to offering the very best singers, bands, musicians and entertainers for all kinds of events, from corporate dinners and weddings. One of the top Caricaturist you can hire on your wedding reception to entertain your guests with his charismatic and funny caricatures. Professional pianist from the legendary train Orient Express Venice-Simplon is available for your wedding ceremony, drinks reception or wedding breakfast! Divertimento has a great range of music and entertainment to offer you for your wedding. We specialise in classical and light classical ensembles and also have jazz, pop, soul & dance bands, folk bands, magicians and other entertainers. Discovered are one of the UK's finest wedding bands and our aim is to make your wedding unforgettable. We have played at 200+ weddings and functions. Asian DJ service that has over 30 years of combined experience in Asian weddings, birthdays & ceremonies. Available for events nationwide. The Kicks are an edgy 4-piece indie-rock band with one of the most talented, energetic & charismatic front men in the UK, backed up by superb musicianship & huge backing vocals. Add a touch of Pure Genius to your wedding with the UK's top professional wedding band. Guaranteed to keep your dance floor filled all night long! Kent Nannies were established in 2001 providing high quality childcare at wedding and events entertaining children of all ages while the adults relax and enjoy themselves. An award winning, experienced and versatile wedding singer, with 5* customer reviews, offering bespoke packages for ceremonies and afternoon receptions. 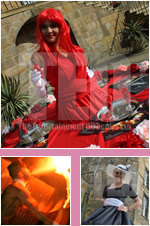 Surefire offers a range of wedding entertainment such as fire performers, circus acts and stilt walkers. Surefire has worked at a range of events and has an act to suit any theme. Live Performers are experts in providing a wide variety of unique entertainment including Magicians,Fire performers,Stilt walkers and bespoke wedding packages for your special day. Fun casino entertainment, professional and bring the wow factor to your wedding, just give us a call. Laura is an experienced classical wedding singer and is available to perform at your wedding, civil ceremony, blessings and anniversaries. Wedding Campervan and Photobooth supplier. We provide professional chauffeuring for your wedding day and a vintage Photobooth so you and your guests can all capture the day! BnJ's Castles in Gloucester provides bouncy castle hire for events and parties, including weddings. Professional award winning firework company, displays nationwide. Vintage Garden Games Hire for Weddings and Special Occasions in East Sussex and Kent. I deliver the games to your venue, I will set them up and collect the games to suit your day. specialists in wedding firework displays with over 20 years experience, BPA accredited and fully insured, we travel all over the UK. The best music from the 1920s and 1930s to add a touch of glamour to your wedding.From Wedding Ceremony, Breakfast, Cocktail Hour and After Dinner Entertainment. Regarded as one of the finest string quartets in London, Titanium is the perfect choice for your wedding. Titanium - the perfect soundtrack to your perfect day. We are a Flute and Harp Duo providing live music for Wedding Ceremonies (bridal entrance, signing of the register and bridal exit), Drinks Receptions and Wedding Breakfasts. We have something for everyone and for all ages. Children's bouncy castle hire, slush machine hire and popcorn machine hire, Fully insured! Photo Booth hire for weddings, parties, corporate & social events. Please see our website for great deals on Photo Booth Hire. The Whitehall String Quartet is London's favourite string quartet for live, beautiful music for weddings and wedding receptions. Go to our website for more info. 20% discount. At Piccolo Parties we know how stressful arranging even the smallest party can be. Let alone a Big one!! We are here to keep everyone entertained. We offer high quality Bouncy Castle Hire, Disco Dome Hire and Soft Play Hire throughout West Yorkshire. Despite our Premium Equipment we offer very competitive Prices! Leading hirer of inflatables and bouncy castles across the Midlands, covering Leicester, Nottingham, Derby, Coventry, Rugby and Northampron. 21 Entertainment is one of the UK's leading wedding entertainment agencies supplying the very finest bands, musicians, entertainers and performers. Have a special event coming up and need some cocktails to tie it all together? Let Event Bartenders be the ones to serve you the bubbly and make your special day sparkle! Hire a photo booth or dance heads for your next event! Wedding photo booth, party photo booth or a corporate photo booth. Book Ivo the caricaturist for your wedding reception to consolidate and entertain your guests with his charismatic and funny caricatures. Personalised poem for your wedding tailored to your details and wishes. Looking for the Perfect Wedding day? Call us today at Vern Allen to find everything you need to make your wedding even more perfect. We Provide bouncy castle hire from £50 upto £150 for a disco dome. We are based in Wolverhampton, Dudley and Telford. Book in advance to avoid disappointment. We are a London based entertainment agency providing clients with the highest quality of musicians and entertainers. Munch are a 4-piece, professional wedding entertainment band from Liverpool, Merseyside UK. Fun, friendly, interactive and unique. Singing the best of Sinatra, Bobby Darrin, Dean Martin and much more, James Green will bring the perfect atmosphere to any event, keep your guest entertained and asking for more. Bouncy Castle Hire in the Northamptonshire area. We offer a great range of the latest Bouncy Castles, Games, Soft Play and Candy Floss & Popcorn at fantastic prices. A 3-piece rock and pop trio who sound like a 5-piece. Teenage Kicks are a professional wedding and party band who pack punch. Their repertoire is huge & stretches over 6 decades. Presenting the most stunning Italian Wedding venues - few are known to be the green heart of Italy like Umbria while Apulia is regarded as the most beautiful. Marty Scott is the UK's Leading Wedding Singer and Corporate Entertainer. Are you searching for the best wedding DJ? DJ Mike Ortiz has the skills and equipment necessary to make your party unforgettable. Add a portable photo booth or selfie stand to your event as a fun and unique way to capture the character and spirit of your wedding, party or event. Photo Booth servie based in manchester - We provide a fun photo booth service for weddings, parties and corporate events all over the northwest. Archery.....bring something different to your wedding reception. Mobile archery range brought to your venue and professional Archery GB instructors. Just imagine the photos! Hire a wedding pianist to play classical music, jazz piano, chart hits or romantic piano music. A wedding pianist can play piano music for your wedding ceremony and reception. A Leicester local photo-booth hirer that services a large portion of the Midlands. BK Booths also have an array of other services and products for hire including inflatables. A live, authentic live band available for hire for weddings across the UK. Based in Yorkshire. New for 2016 a white wedding bouncy castle, 15x15ft White adult bouncy castle with rain cover £250 for the whole day Call 07757459954 for availability. Duncan William is a Birmingham magician and mind reader guaranteed to leave your guests laughing in amazement. Established since 2003, providing live solo musicians, jazz trios, classical string quartets and pop, soul and Motown bands for weddings, parties and other events in Yorkshire. wedding bouncy castle hire, for the day or overnight, offering a bespoke 1 off design bouncy castle purposly made with the wedding bride & groom theme. Cocktail piano music for the champagne reception and wedding breakfast. From smooth jazz to pop and classical. Please visit website for details and to listen. From PA systems for speeches to large sound & lighting systems for bands & DJs we have a solution perfect for your event. Based in Kent and available throughout the South East. Steel City Casino is one of the UK’s premier fun casino hire operators, supplying top quality themed casino events guaranteed to impress your guests. Ideal entertainment at any wedding or civil ceremony. Seeker are the perfect choice for anyone who loves soul music and a good old get down! Available with a choice of lineups to suit any occasion. We are a nationwide Firework company providing professional displays for weddings and events all year round. Aisling Ennis is one of Britain's most exciting harpists. Peforming on her 23 carat gold concert harp, Aisling is available for all wedding ceremonies and receptions. Vintage singer,Madeleine Cooke and pianist Nicholas Agnew perform the old time romantic classics from the 1920s, 30s, 40s and 50s. We cover all of the UK. Thanks. Metropolis is London's Premier Party Band. Metropolis is guaranteed to take any corporate event or private party to the next level. We provide beautiful specially trained white doves for release by the bride and groom only, or everyone in the Bridal party, and flocks of up to 30 birds,released from a basket. Get in touch with me to see how I can help sprinkle a little magic across your big day. Perfect entertainment to keep your guests thoroughly entertained and bewildered! We're pleased to offer a huge range of different party games and equipment for you - check out our photo booths, our rodeo bull, our cash grabber and our mobile climbing wall. Aces Fun Casino Hire - Bringing all the fun of the Casino to you at affordable prices! We have been advising clients and providing top-quality entertainment to suit all tastes since 1981. Bands, artists for live background music and professional, reliable D.J's. At 1st Galaxy Fireworks we pride ourselves in supplying the highest quality of fireworks online and professional wedding fireworks displays to make your day unforgettable. We specialsise in hiring the best live bands available for weddings, parties & corporate events. You can watch live videos, listen to demos, & get an instant quote online. The leader supplier of inflatable and fun products in the North-West region. We offer a wide variety of products which are perfect for any occasion. earcandy is a unique UK entertainment agency that allows you to tailor your live entertainment needs. . We have rock, pop, jazz, karaoke bands as well as pianists, solo singers. Music and Events is a Norwich based entertainment agency & artist management company. We specialise in providing wedding entertainment, corporate event entertainment, entertainment for hotels, resteraunts and other venues. We provide professional fireworks displays starting from £500. Wedding Singer UK is a business that specialize in beautiful singing for all types of weddings. Quality is the hallmark of 'Wedding Singer UK. A wide repertoire is offered. Hire a photo booth for your wedding that uploads the photos to the internet for everyone to download their own copy. Prices from only £275 for up to 5 hours. Elegant professional strings to enhance your wedding day! My name is Soozi and I'm a professional caricaturist working in and around the UK. If you are looking for an unusual form of entertainment, then that's me! Matchbox Music is one of the UK’s most exciting live music agencies, representing some of the finest bands for hire across the UK. Alex caricaturist will bring some extra fun to your wedding and make it special. He will draw funny images of your guests to remember your wedding. 4 piece party band that bring the best of live Soul, Motown, Funk, Pop and Dance music to your happy occasion. We can perform throughout the day from ceremony to reception. A Leicester based inflatable hirer offering a variety of products from bouncy castles to large inflatable slides. BK Entertainments is able to cover a large are of the Midlands. One Stop Castles have a great selection of bouncy castles, photobooth, soft play, disco dome bouncy castles, facepainters, the choice is endless!! We are a UK based entertainment agency that supplies Fire performers, Acrobats, Magicians and jugglers for every type of event throughout the UK. We have created a fantastic range of wedding firework packages which we can tailor to you. Contact us for more details and pricing! Alchemy is a high tech, cutting edge duo specialising in wedding entertainment. We play party rock and pop anthems and give you the big band sound you want in a small package! Pro Music UK Ltd has been providing high quality entertainment around the country for the past 5 years. We are committed to help make your your wedding have that X-Factor, which will have people talking about for months. The Cornwall Photo Bus is a fabulous mobile photo booth in a VW camper van. With green screen and instant print photos, the Photo Bus will leave your guests giggling all night. Arron Jones is wedding magician working in and around Sheffield and South Yorkshire. Midlands based hirers of top of the range Greenscreen Photo Booths, Magic Selfie Mirrors, and Selfie Pods. Rigaudon Music provides classical and light music for wedding ceremonies and receptions.String Duo, string quartet/trio available.Guildford area, Surrey and South East. From £290. Wedding Band Officially the best wedding band in London and home counties. Rodeo bull rentals don't have to be a hassle! We at Rodeo Hire are thrilled to offer bucking broncos, simulators and similar rodeo rides for hire throughout the UK. We supply Mobile Disco, Fun Casino Hire, Candy Carts and PhotoBooths. Bounceabout and Play provide bouncy castle hire, soft play, fun run, disco bouncy castle and ball pools for hire in Newton Aycliffe, Darlington, Bishop Auckland, County Durham. Brass Monkees are an electric 9 piece band bringing an action packed fun-filled combination of Soul, R&B, Funk and Motown. We are a fun and vibrant catering service, specialising in candyfloss, popcorn and chocolate fountain hire. Our services are the perfect addition to all occasions. Darren Delaney has many years’ experience performing magic at weddings and is the ideal choice to add that extra something to your special day. Professional Fireworks Displays, specialising in Weddings. For the perfect end to your perfect day, no-one will leave with a dry-eye! Spectacular displays guaranteed, at extremely competitive prices! Our services include DJs, sound and lighting hire, star-lit dancefloor, photo booths, magic mirror, star-lit backdrops and much more around the Midlands. David Fox is one of the finest wedding magicians in the UK. Bring some magic and amazement to your special day with David's unique repertoire. Bouncy Castle Hiring company operating throughout Mid Ulster and Belfast. Make your day extra special with fun and long lasting memories with Photo Booth From LP Designs. Murphy is a highly sought-after acoustic guitarist/singer playing covers from 60's - now. Murphy is a mjust have for any wedding. Unique stripped-back piano/vocal and guitar/vocal versions of favourite songs for wedding ceremonies, receptions, and wedding breakfasts from just £140. Like Live Lounge? Love us! Nick Rushton, Liverpool's premier Wedding Magician. Amazing magic, mind reading and more for you and your guests. The RockPins are an award nominated Live Wedding Band performing throughout London, Kent and across the south east. 2 hours of live music plus great free disco. Visit our website. Our award winning opera singing waiters and surprise singing chef are the perfect dinner entertainment for your wedding day. Smile Booths provide portable, instant photo booth rental at a price you can afford! LeFunk! is an exceptional funk, soul, disco and pop covers party band with a back catalogue of hundreds of delighted clients. Low Key Music specialises in tailored live music entertainment for all celebrations. Need a pianist for your wedding? Martyn Croston is a professional piano player available in London and the home counties. Book now and check the availability of your date. Combining the talents of four young professional musicians the Akina String Quartet provides captivating musical entertainment for weddings and special occasions across Berkshire. bouncy castle and wedding hire business based in Gloucestershire. We have lots of exciting products to make your special day that bit more special. Hire Molly our very cute Vintage Caravan Photo Booth. She comes full of quirky props guaranteed to get your guests in the mood for fun. The Dukes are an energetic, crowd-pleasing 4-piece. They are professional musicians who push their performances to the max. Their repertoire includes hits from the 50s to the 10s. Christopher presents interactive magic at weddings in his fun and distinguished style. Perfect as entertainment to break the ice at reception drinks or around tables. Enquire for a quote and to see testimonials. Bouncy Castle, Rodeo Bull, Double Decker Playbus, Slush and Popcorn Machine Hire Coleraine, Ballymoney, Ballycastle, Portrush, Portstewart, Castlerock, and beyond. The Soul Miners are a 100% live, high-energy, 8-piece party band, and we specialise in performing Motown & classic soul music at weddings. We are based in Cardiff, South Wales. Noodle Entertainment Agency provides th very best in wedding bands, singers, musicians and wedding DJs to clients across the North West of England and Wales, for any any budget. Touch screen photo booth INSIDE a VW camper van. Complete with a fully stocked box of wacky dress up props. Based in Welling, we cover Kent and London. Yes Entertainment provides the UK's top wedding entertainment include wedding bands, discos, string quartets and everything else you need to make your wedding the talking point of the year! Leading supplier of inflatables, photo booths and rodeo bull hire across the Midlands and UK. Photobooths are guaranteed to make your day fun. We strive to provide the very best for our customers ensuring that their experience is both professional and enjoyable. Pianist and Violinist for wedding ceremony, reception or meal. Piano and violin player Simon Jordan will play any tune. Hear the musician play on Skype or FaceTime. InHouse Entertainment is one of the UK's leading Interactive Entertainment suppliers to both the Corporate & Private Sector. 5 Star Wedding & Corpoate Entertainment from Frank Holden, Uk's No1 Sinatra Tribute Act.8 perfect wedding packages available from £495.00. Digijaxx mobile Dj Hire can provide you with only the best Quality equipment, lighting and music. We can build your mobile Dj hire setup to suit your own requirements. Live Caricature Entertainment. Amusing your guests through any Wedding lulls. Capturing convincing funny faces in just a few minutes. Guaranteeing great pictures, and great fun! Bouncy Kings is a leading bouncy castle hire company operating accross Leicestershire, Derbyshire, Nottingham and Warwickshire. Hiring out inflatables, soft play and fun foods. Outstanding vocal ability, performing dancefloor filler party classics by night and heartfelt soulful ballads by day. Complimentary music package with every booking. A Unique converted Double Decker Bus Bar. A 1996 Volvo Olympian converted into a bar! Fully functional and licensed 33ft merriment maker to enhance any special occasion. If you're in Weston-Super-Mare, Bath, Bristol or any of the surrounding areas, you'll be able to get a bouncy castle hire service you'll love from Bristol and Weston Super Bounce. We provide Dance floors, photo booths, entertainment services & interactive products in Liverpool, Manchester and Cheshire for an amazing wedding or event. We are a professional family run company that specialises in hiring Photo Booth across Essex and surrounding counties, Hiring for weddings, parties and corporate events. 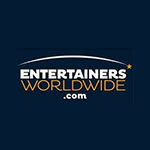 Entertainment HQ offer a one stop wedding entertainment solution. Service music Close up Magic PA Hire M.C Duties Children's Entertainment Dancing on Clouds/Mood lighting. Wedding Brass consists of three experienced trumpet players and can provide you with ceremonial, classical or modern music. dhol players, asian wedding DJ, Punjabi Dhol, Indian DJ, Bhangra, Bollywood Dancers, Brass Band Baja - Contact us on 07706272481 North West & West Yorkshire area's. Bouncy Castle and Inflatable Hire, Soft Play Packages, Games, Bowling Alley, Assault Course, Mascot Hire, Sweet Cart Hire, Personalised Sweet Cones,children's party food and more! Tristan Mackay is a two times No.iTunes singer/songwriter and guitarist. Alongside a successful recording career, Tristan also performs unique acoustic covers for weddings. Its the amazing wedding photo booth in a London Taxi! Complete with touch screen interface, unlimited visits, a 6x4 print out each visit, crazy props box and helpful operator. Providing hire of the unique Magic Mirror Photobooth. We can also theme the mirror and props to suit your needs. Yorkshire based professional solo acoustic guitarist and singer, available to perform fantastic live music for weddings, events and special occasions, anywhere in the UK. Duncan William is a wedding magician and mind reader in Nottingham, Derby, Leicester and Beyond. Fantastic Wedding Fireworks are UK based award-winning suppliers with over thirty years of experience. Incognito Artists is an entertainment agency providing a wide variety of incredible acts which involve bespoke performance packages. “Top Small Wedding Band in the UK” as listed in Brides Magazine. Performing a mixture of music, guaranteed to keep your guests dancing. DISCO music in-between live sets at no extra cost. Our small, family run Wiltshire bouncy castle hire business offers a reliable and friendly service to help your parties and playtimes go with a bounce! Claire's castles provides a wide range of bouncy castles and inflatables to a wide variety of customers. From the small back garden party to the big fun day's and corporate events. http://www.enchantedcelebrations.com/summer-engagement-special/ is a young, fun, and cool and trusted NJ Wedding DJ company. Professional pianist from the Orient Express train, based in Southampton,available for weddings and corporate events in Hampshire, Dorset, Wiltshire,Berkshire,West Sussex,London.. MOBILE FUN CASINO OPERATORS - ROULETTE, BLACKJACK, POKER, CRAPS. A CASINO IS A GREAT ICE BREAKER FOR YOUR WEDDING ENTERTAINMENT. PERSONALISED FUN MONEY INCLUDED IN THE PRICE. Award winning Professional Magician Stuart Watkins is the perfect choice of Close Up Magician and Table Magician for all corporate. Exquisite singers for unique occasions. From opera to musical theatre- let us add a touch of musical elegance to your wedding,corporate event or special occasion. Best Party Hire supplies bouncy castle and soft play hire equipment, to the Leamington, Warwick and Kenilworth area. Professional classical and contemporary string quartet available to hire for weddings & functions across London & the South East. Encore is the fastest way to book musicians. People love us because with almost 10,000 musicians, we can provide ANY sort of musician or group. Average booking time is 1 hour. We provide breath-taking, live entertainment and genuine industry knowledge to our customers and guarantee exceptional live entertainment and service for weddings uk wide. Booth Fantasia hire company providing photobooth hire to events held across the south west, covering Devon,Cornwall,Dorset,Somerset,Avon. professional and personalised service. Carlos is a captivating Spanish/Classical guitarist. He will bring an extra touch of elegance to your wedding. He has a huge repertoire that will delight your clientele. Professionally created song lists for your next event. Playlist categories: days of the year, eras, genres, love, musicians, top 10's, topics and our most popular - weddings! Close-up and table magician Dan, perfect entertainment for the quieter parts of your wedding day. We provide high quality, reliable bouncy castle hire in Belfast, Dundonald, Bangor and surrounding areas. We have an extensive range of inflatables to choose from. Providers of first class entertainment to the wedding industry. Our roster includes bands, DJs / karaoke, musicians, magicians, circus acts and much more! Some of the UK's finest voices will light up your day posing as waiters/staff and then spring into action singing some of your favourite songs. Wedding bands for your special day to function bands for your company event. Here at DG Music we have pop, rock, jazz, harpists, acoustic singers, classical musicians, the lot! Bollywood string quartet for Asian weddings. Shaadi entertainment band offering violinist, trio or quartet. Wide range of Bollywood songs. Speechy create amazing wedding speeches for people who want to add a special moment to their day. They’re a crack team of ex-BBC scriptwriters making speeches cool. Make your special day amazing with our superbly priced, yet truly spectacular wedding fireworks. The team behind Roar Events have 30 years of experience in the Event & Wedding Industry. We can provide everything for the Special Day from a Wedding Pianist to Wedding Planning. Professional and Reliable childrens Entertainer, with comedy Magic, Live rabbit and Dove, Puppets, Games and more. Member of The Magic Circle, Equity and CRB approved. Make your wedding one to remember. 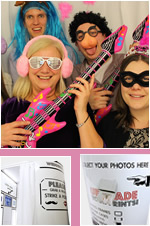 Your guests can pose for endless silly photos and videos full of laughter using our fully customisable Photo Booths. Scarlet Events are the UK's leading party planners, arranging everything from inspirational venues to innovative entertainment creating truly stunning, world-class parties. Looking for someone to keep all your guests old and young entertained with some amazing magic? Close up, magic shows, balloon modelling, circus skills & much more call now! If you require traditional wedding music, or something more modern. Richard is the perfect choice to play for your wedding. The music is perfectly tailored for your special day. Vintage singer, Cherry Morello, brings to you the old-time classics from the '20s, '30s, '40s, '50s and '60s. A chanteuse of the highest quality, Cherry will entertain any wedding. Wedding Singer/DJ Services. I sing a variety of material and work to your tastes. I offer packages to suit all budgets, with/without DJ Services dependent on requirements. Absolute Bollywood is a London based dance company offering world class Asian & Indian dancers for weddings, hen parties and events. 1st Choice offer a wide range of inflatables suitable for Weddings and many other celebratory occasions. String Quartet and Trio providing high quality live string music for ceremonies and receptions. Vast and varied repertoire from classical to current pop - something for everyone!